This page isn’t for everyone, but maybe other “collectors.” Sometimes I need to show somebody one of my kits, or (more often) I need to quickly see them before I buy a piece or part one may be missing. 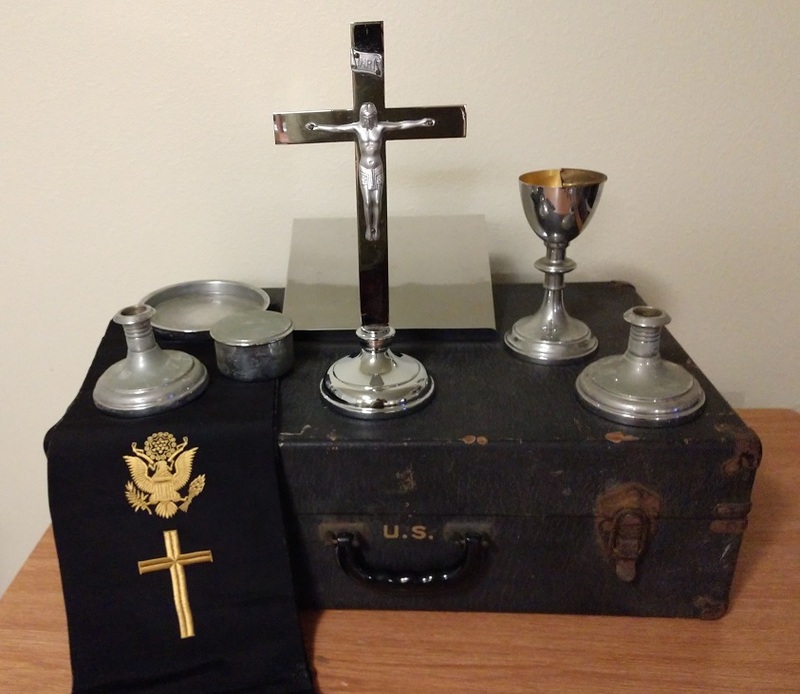 Feel free to look, but understand it’s just my personal collection of chaplain kits and just one picture of each (each picture is a different kit). 1897 Homan’s Sick Call Outfit. 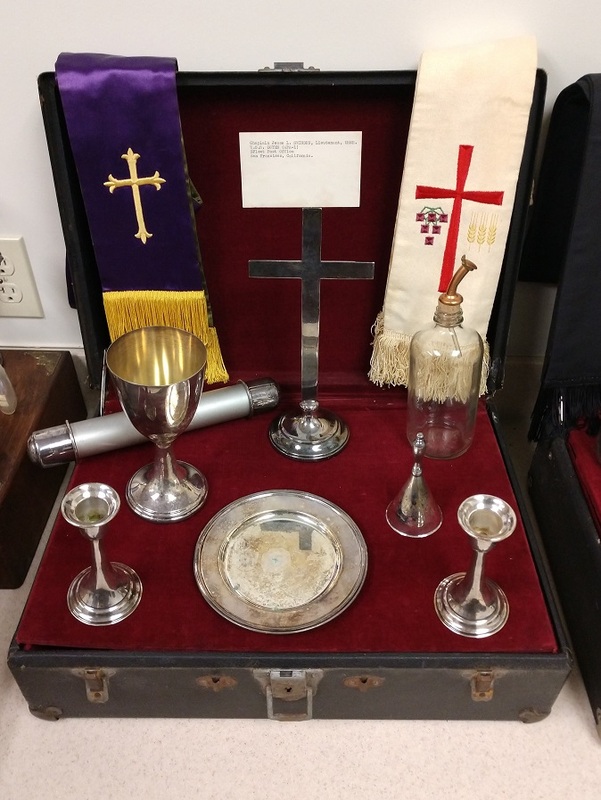 This box was apparently part of the kit used by a Catholic chaplain or minister assigned to the 23rd Infantry Regiment. 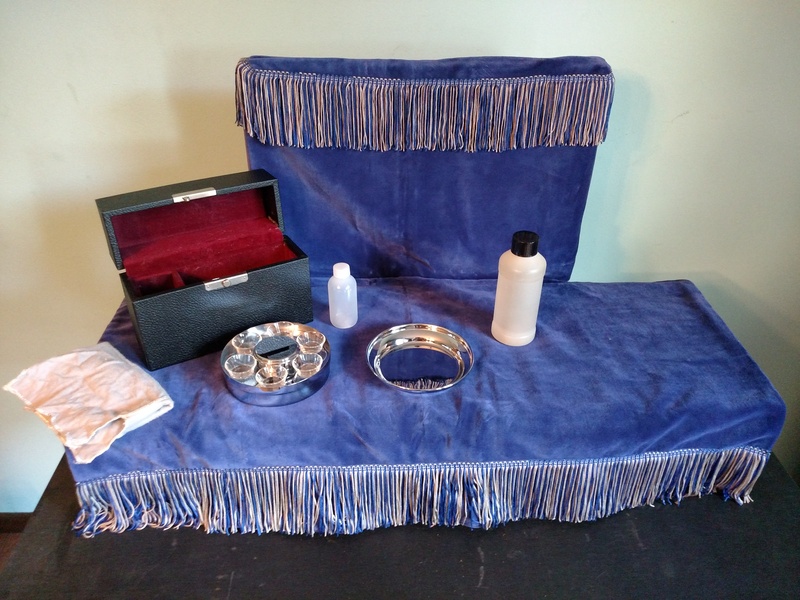 The accouterments aren’t original to the box but were the standard accessories of the outfit (author’s collection). 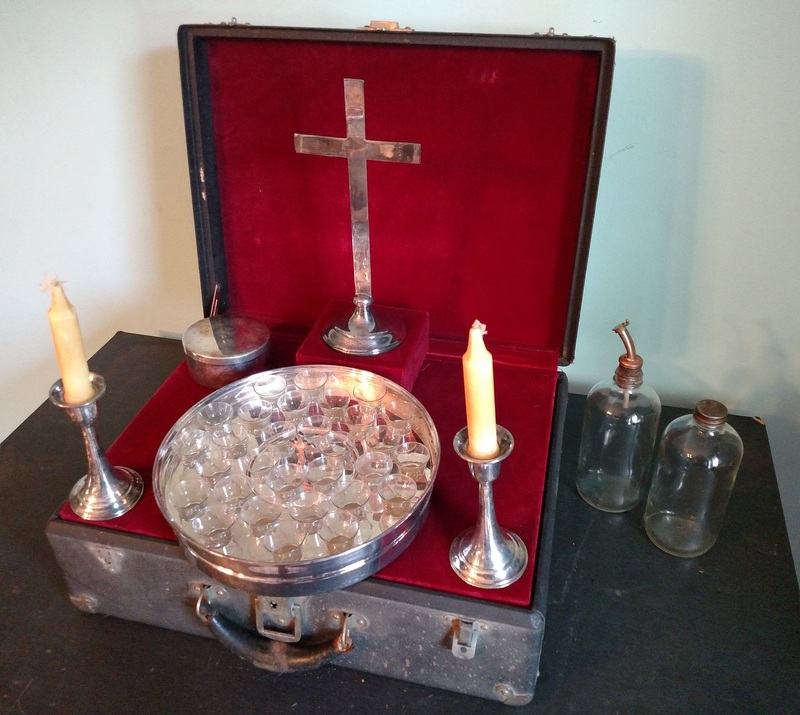 WW2 Kit with individual cup communion tray (author’s collection). 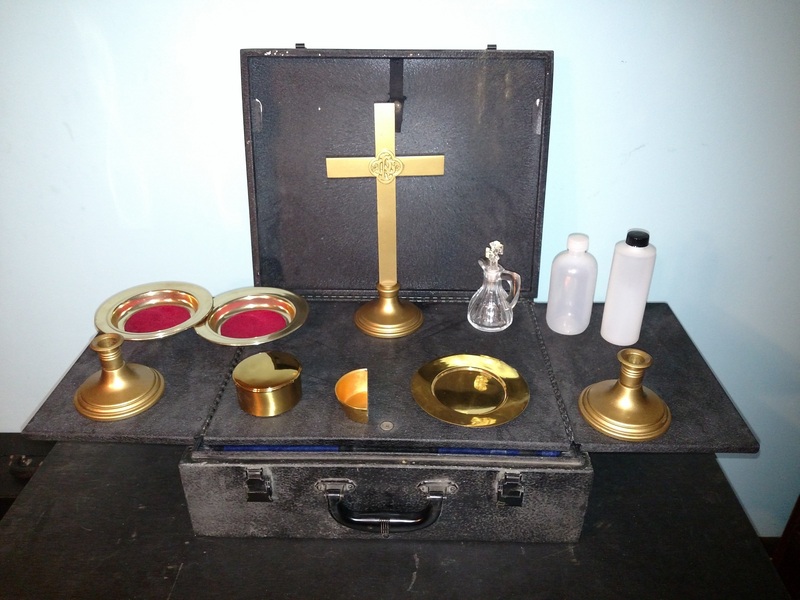 WW2 Protestant Chalice Chaplain Kit (author’s collection). 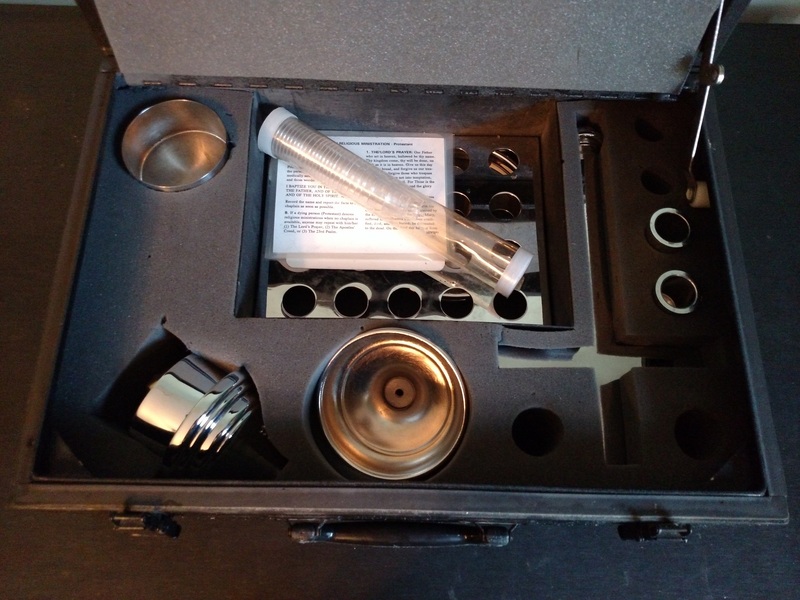 WW2 Chalice Kit (author’s collection). 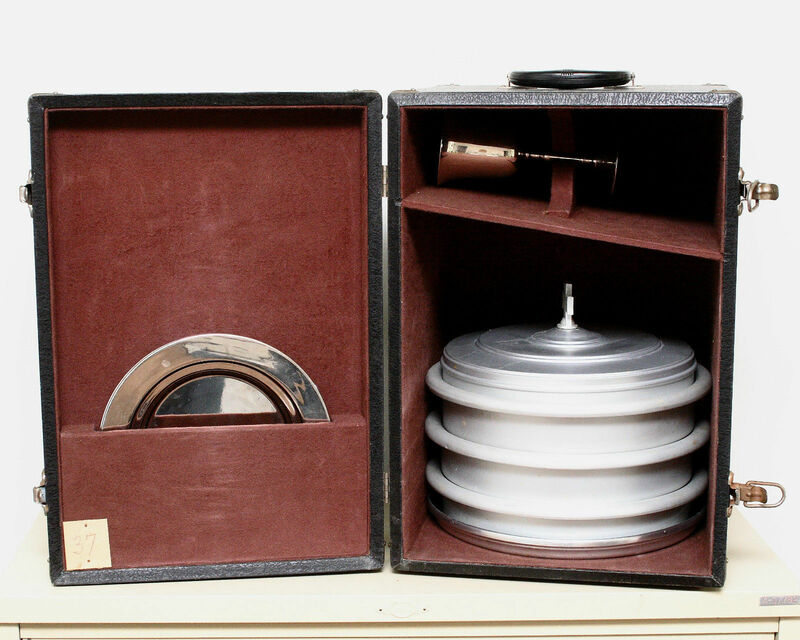 Korean War (1952) chrome chalice kit (author’s collection). 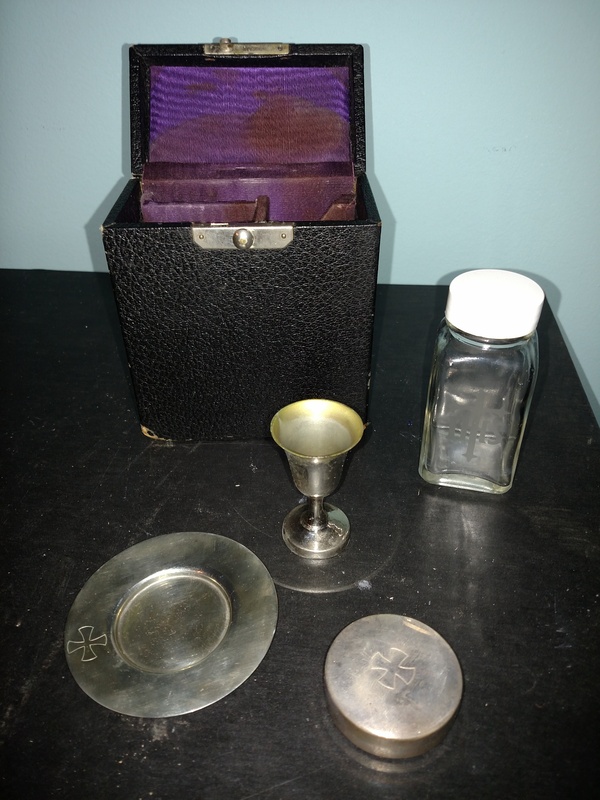 Post-WW2 troop transport kit, the individual cup communion trays and chalice are not original (author’s collection). 1960’s/1970’s (?) 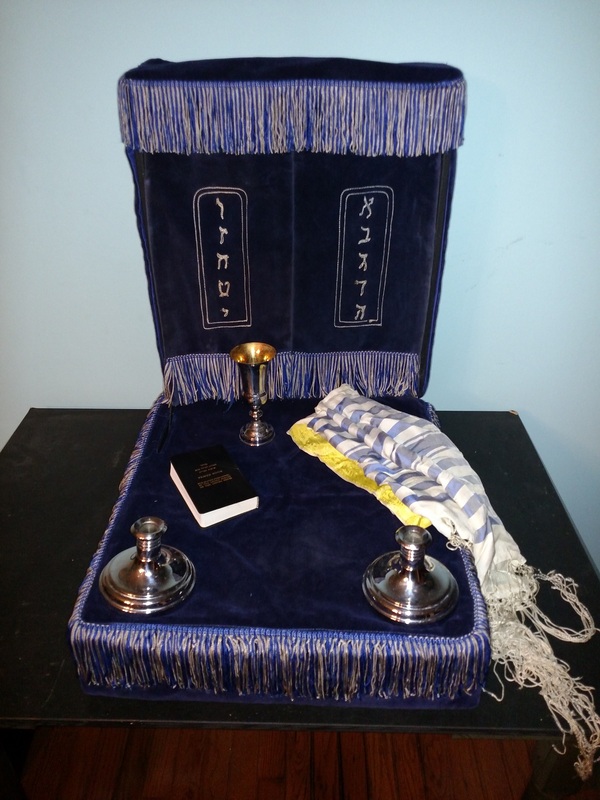 Jewish kit, missing Torah scrolls, yad, ? (author’s collection). 1960’s/1970’s (?) 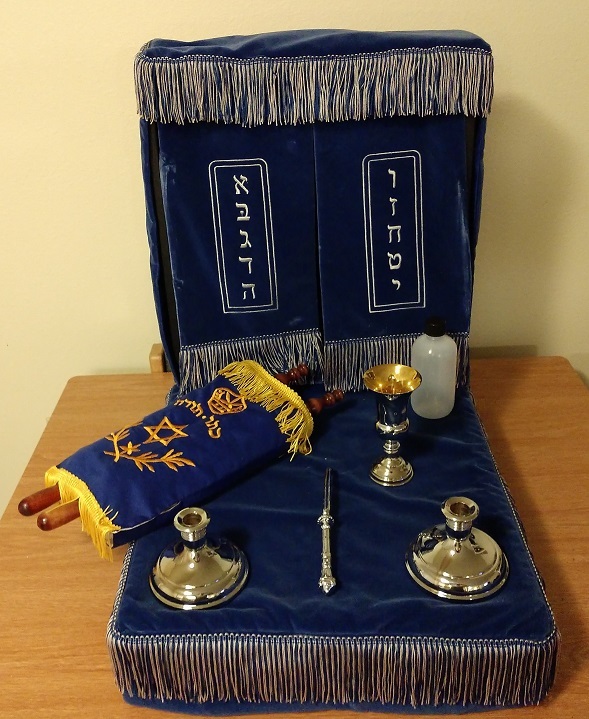 Jewish kit (author’s collection). 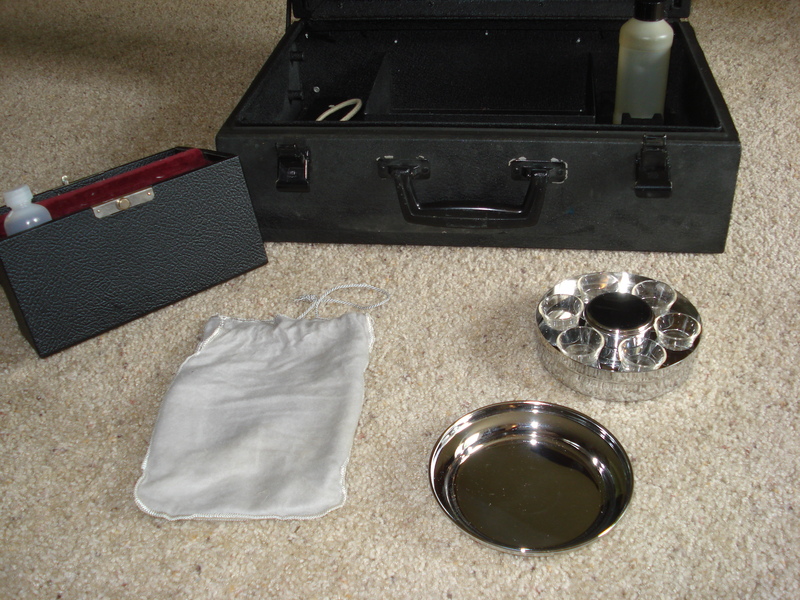 1962 Protestant Chaplain Kit (author’s collection). The Army went to Chrome kits after the brass, so this likely follows the 1962 kit, above (author’s collection). 1970’s (?) 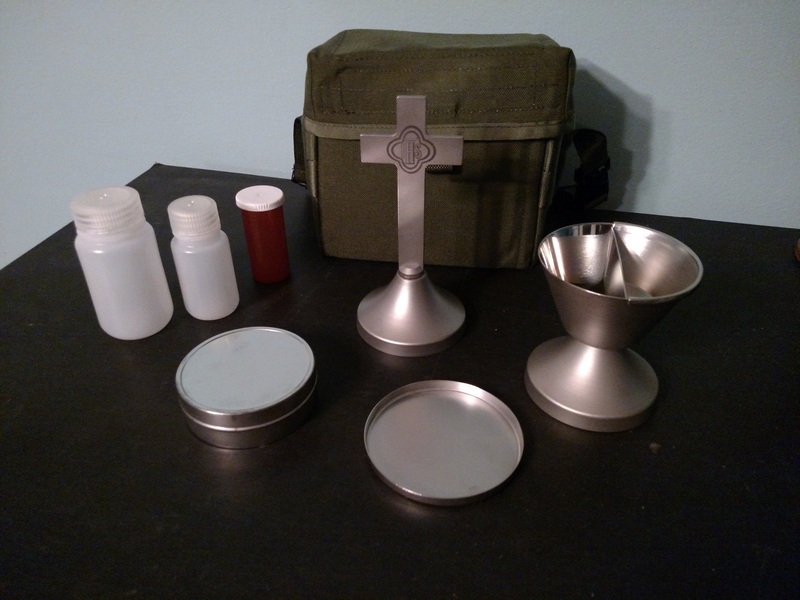 chrome chaplain kit, interestingly with a silver chalice (author’s collection). 1960’s (? ), missing much (author’s collection). Unk date, hodge-podge (author’s collection). 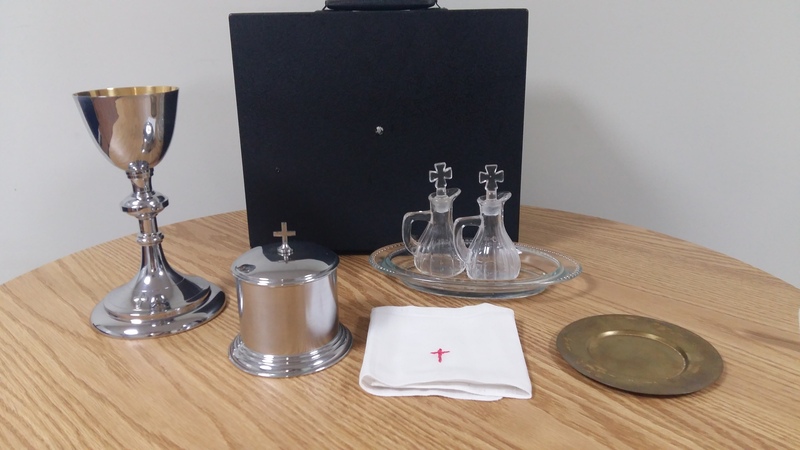 Unk date chrome kit missing ciborium cover, cups, candlesticks (but where do they go?) 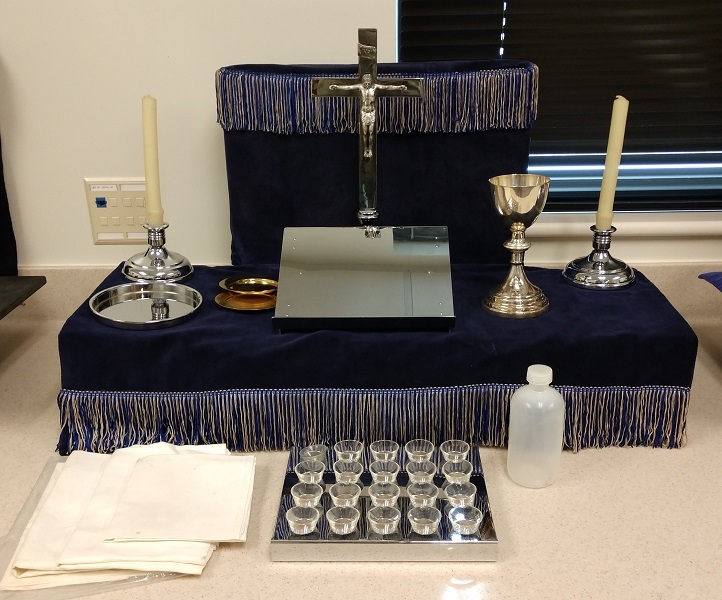 (author’s collection). 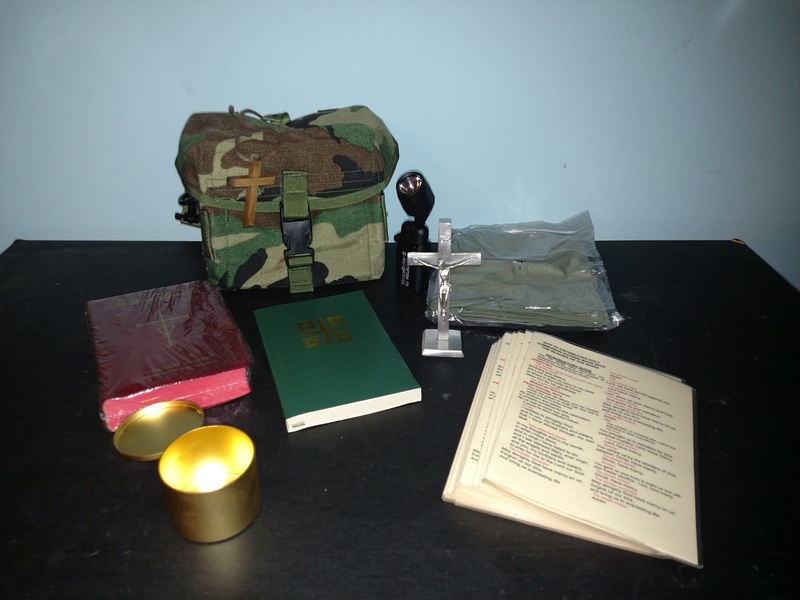 Vietnam era Protestant Chaplain kit Type 1, reconciliation stole doesn’t go with this kit (author’s collection). 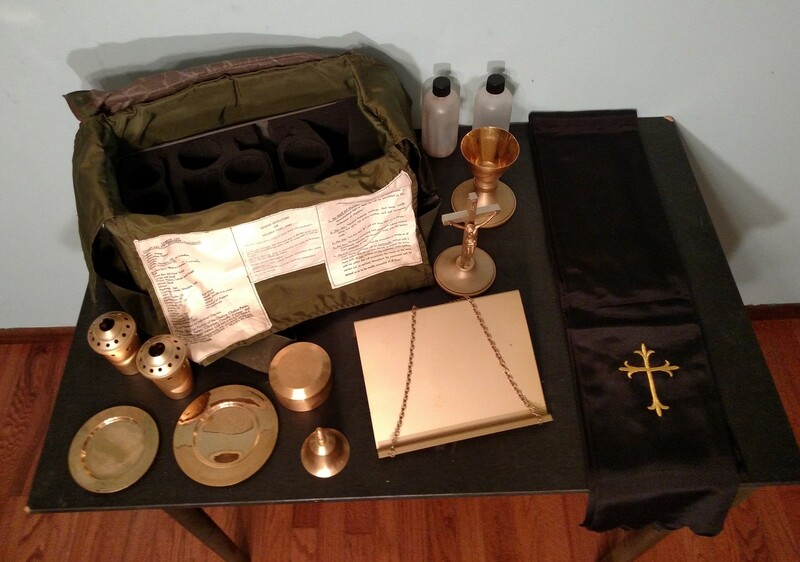 Vietnam era Protestant Chaplain kit Type 2, also has stole & linens (author’s collection). 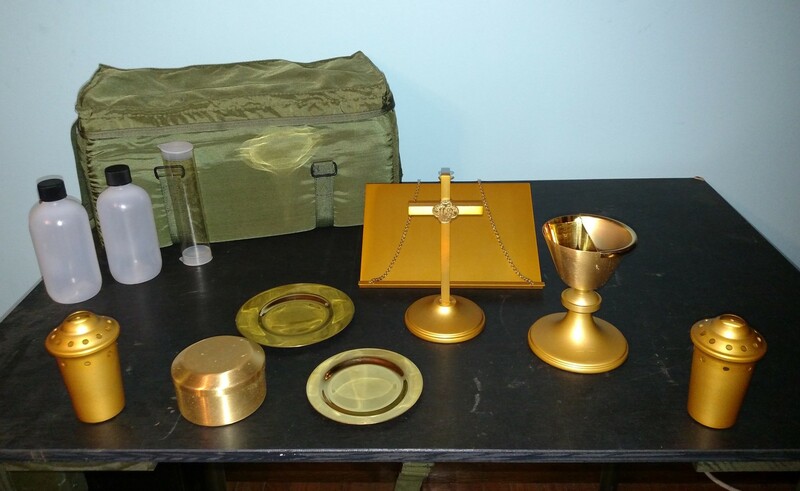 Catholic Vietnam era Type 2, also has alb, cincture, chasuble (author’s collection). 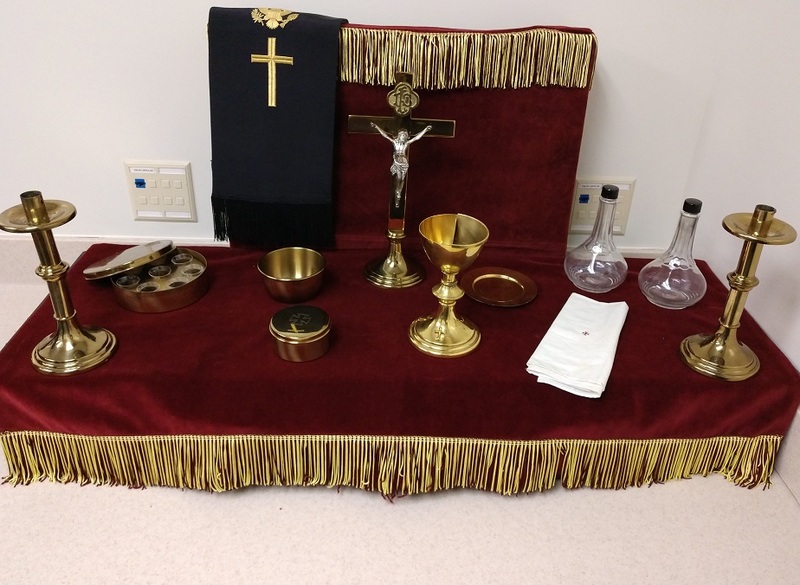 Modern Christian Chaplain kit, OD green (author’s collection). 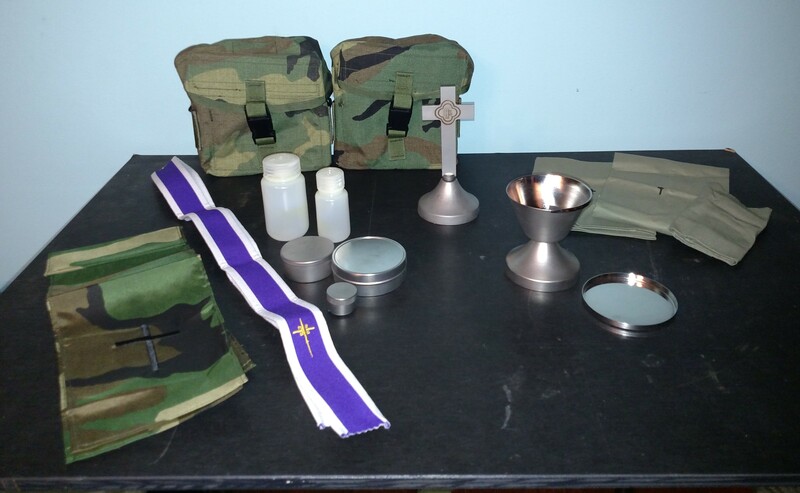 Modern Christian Chaplain kit, BDU (author’s collection). 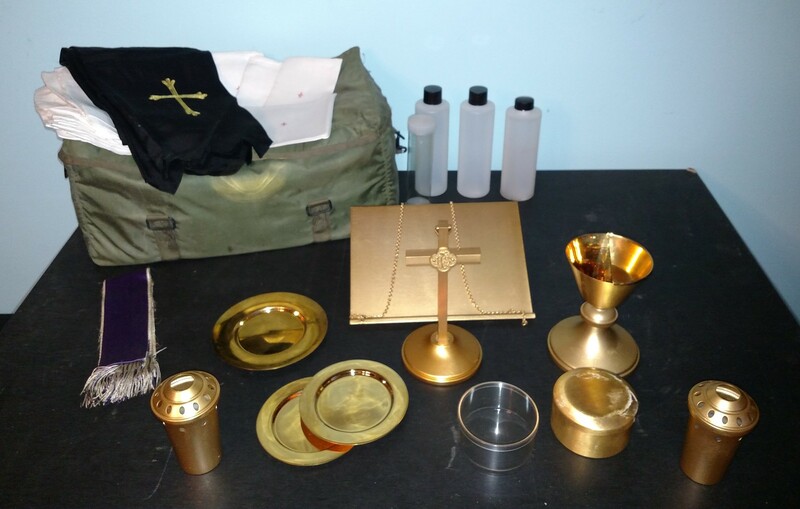 Modern Catholic Ministry Extender kit, BDU (author’s collection). 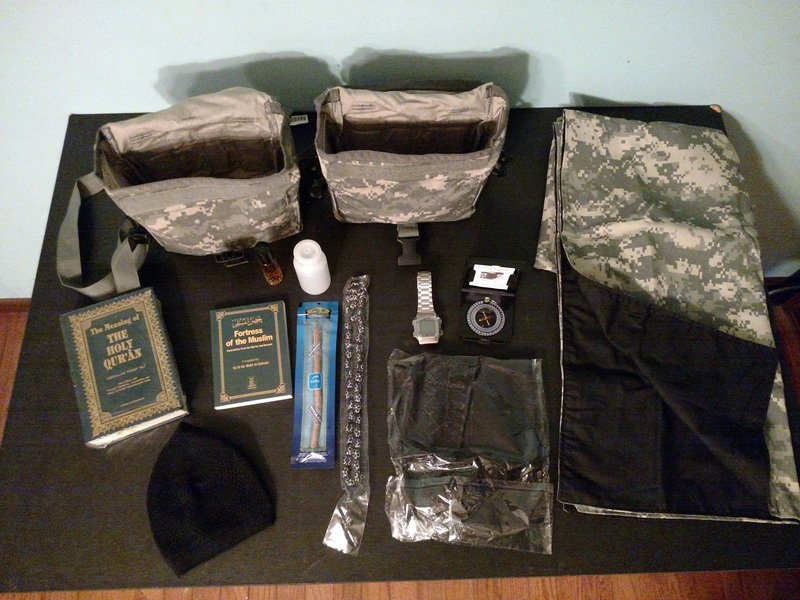 Modern Muslim kit, ACU (author’s collection). 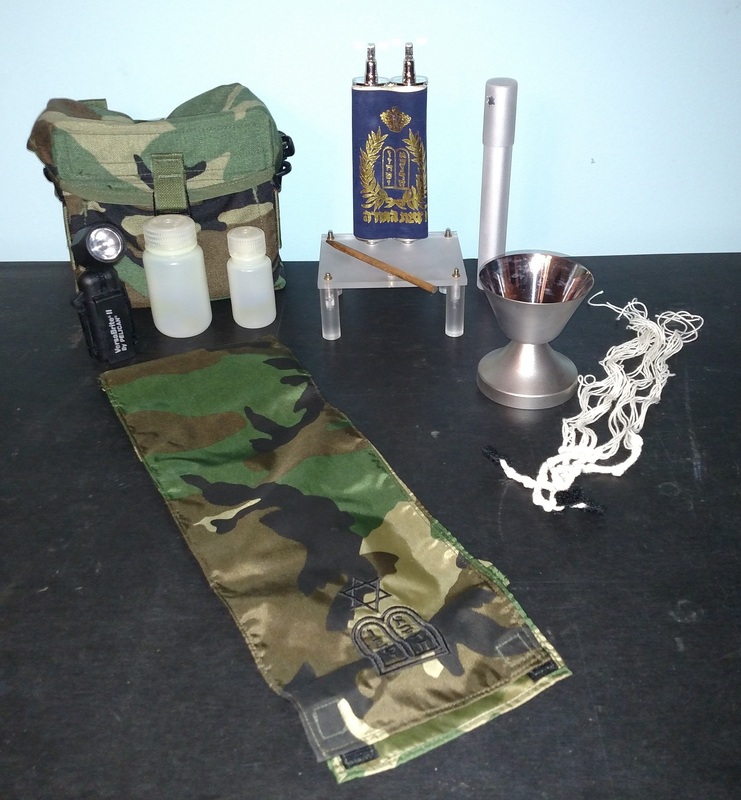 Modern Jewish kit, BDU. 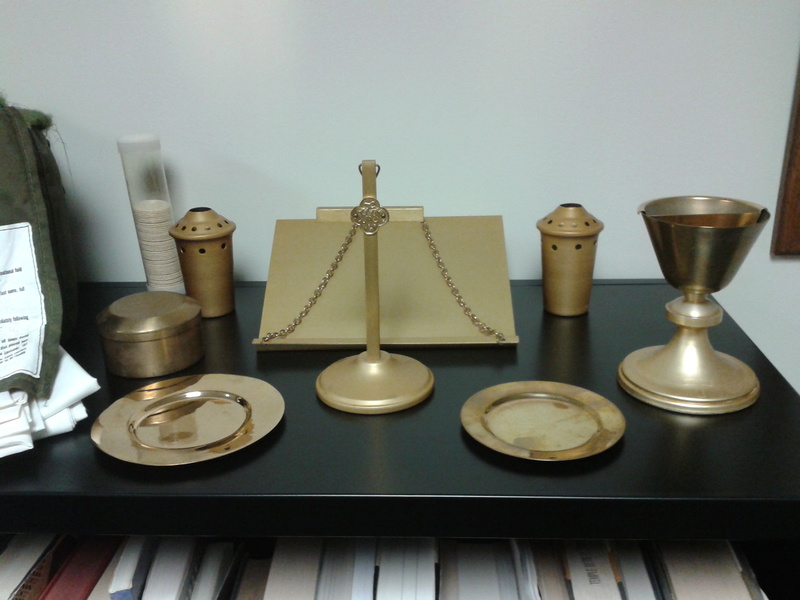 I also have another complete except for Torah stand legs (author’s collection). 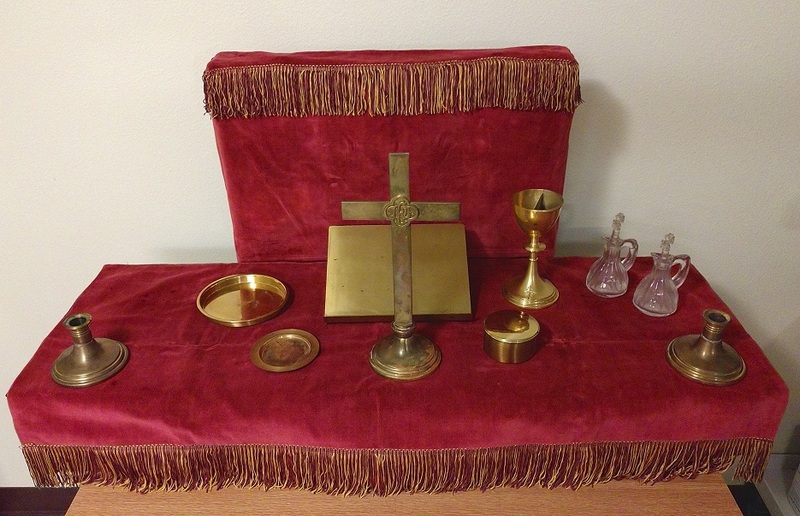 Small chalice kit from the 1970s-1980s (?) 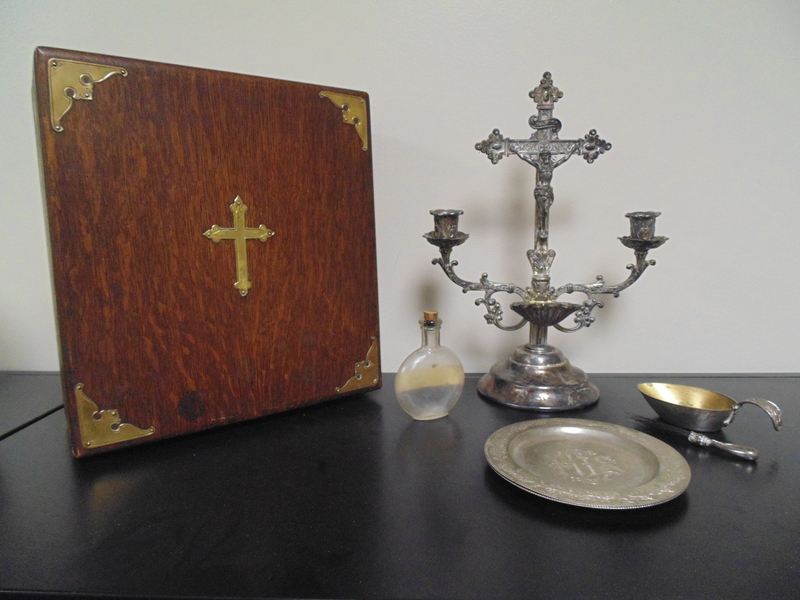 (author’s collection). 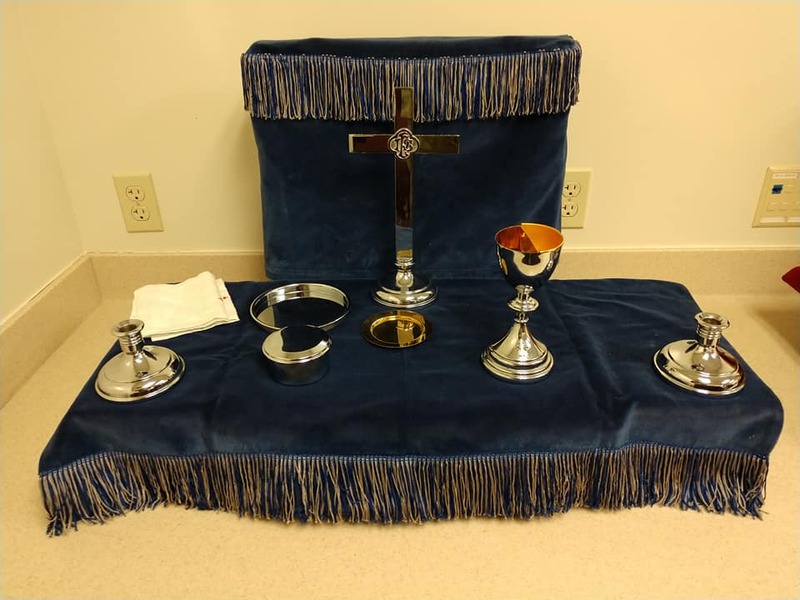 Unk date 6-cup visitation communion set acquired in a metal box from another type kit. 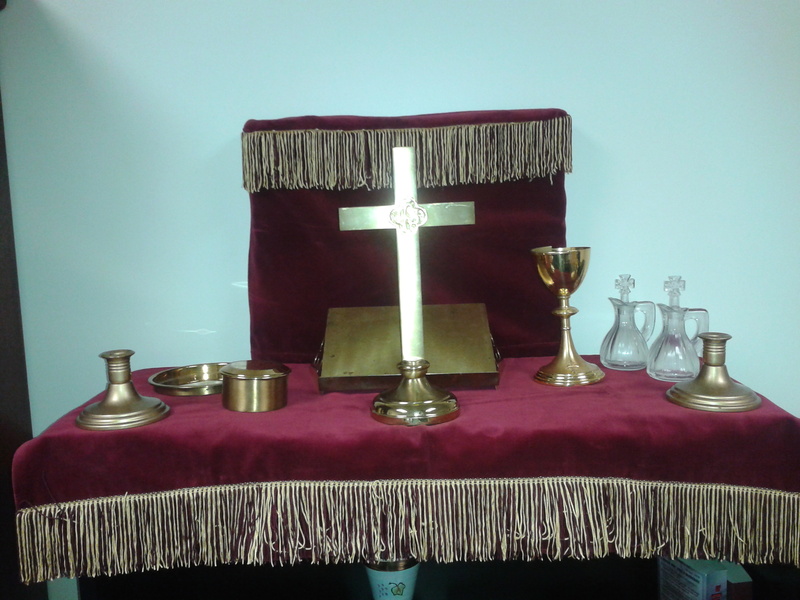 (author’s collection). Unk date (1960’s to present?) 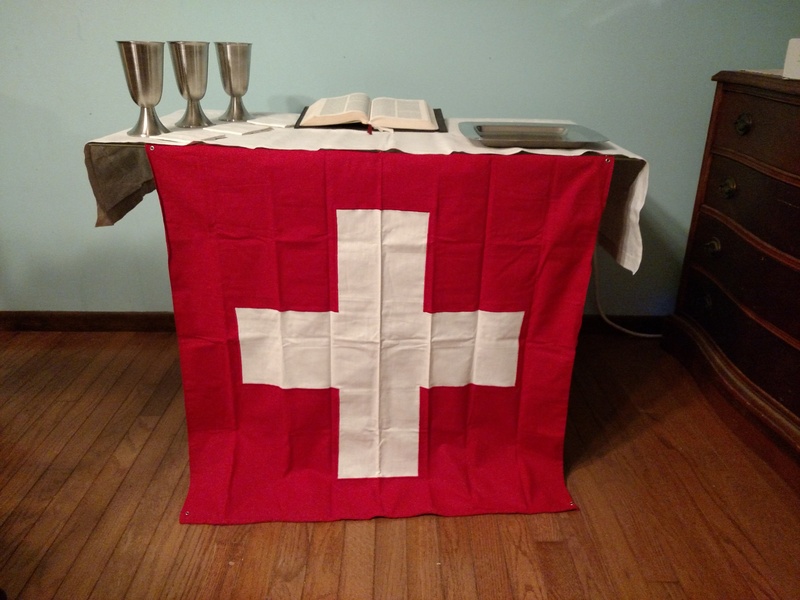 Swiss Worship kit (author’s collection).